Root canal treatment is a remarkable procedure with a very high rate of success, and involves removing the diseased tissue, halting the spread of infection and restoring the healthy portion of the tooth. In fact, root canal treatment is designed to save a problem tooth; before the procedure was developed and gained acceptance, the only alternative for treating a diseased tooth was extraction. 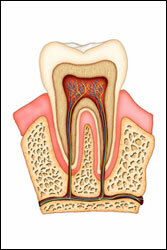 Root canal treatment usually entails one to three visits. During the first visit, a small hole is drilled through the top of the tooth and into the inner chamber. Diseased tissue is removed, the inner chamber cleansed and disinfected, and the tiny canals reshaped. The cleansed chamber and canals are filled with an elastic material and medication designed to prevent infection. If necessary, the drilled hole is temporarily filled until a permanent seal is made with a crown. For more information on Root Canal Treatment in the Union, MO area, contact Dentist Michael C Scheske, DDS, PC by filling our Contact Form or calling (636) 583-8100 today!